Includes: Integrated pedestal stand and integrated speaker system, NTSC and ATSC (HDTV) tuners, 4 HDMI high-definition inputs, 3 component video, 4 composite video, 2 S-Video connection, PC Input. The Pioneer PDP-5080HD hits the market in late summer 2007 to ready acceptance from the flat panel TV marketplace. Improvements over the previous PDP-5070HD include a dramatically improved black level and minor improvements in brightness. Other more minor improvements include 4 HDMI inputs rather than 2. Pioneer continues to market to the home theater afficianado and high end A/V market and focus it's engineering dollars and attention on plasma technology. No irregularities are present in the picture when viewing HDTV, regular definition programming, or test patterns. In order to fully optimize the color reproduction of our PDP-5080HD, we used a colorimeter, a Sencore High-Definition signal generator, and a specialized software suite to calibrate the television to the Imaging Science Foundation (ISF) standard color temperature of D6500K. Figure 1. Optimal picture settings for the Pioneer PDP-5080HD using ISF Calibration. The higher Color Temperature settings make the picture's white balance too bluish. Because our test PDP-5080HD was calibrated with ISF-certified equipment, using Pioneer's proprietary picture improvements, such as PureCinema, is not necessary unless you are viewing film sources. PureCinema is then necessary to properly de-interlace film transfer content. According to our research, other measures such as Digital Noise Reduction (DNR) actually seem to degrade the picture of these upper-tier plasma televisions. Using our reference Blue Ray BPS1 HD DVD player set to 1080i resolution, we watched several Blue Ray test discs as the plasma performed nearly flawlessly. The difference with the Pioneer plasma's picture quality starts with a deeper pixel cell structure than other plasma panels. The result is a more 3 dimensional image. Most LCD televisions will look "flat" by comparison. The introduction of HD signals realized Pioneer's deep cell structure's performance potential. It is truly stunning! The last twenty minutes of the movie Scarface, arguably the most violent in movie history, engross the review staff as the PDP-5080HD accurately displays the fast-action gun-fighting sequences. The flamboyant colors from Montana's mansion and the bright flashes of gunfire do not blend together at all. There is no false contouring, no picture lag, great shadow detail. As Tony screams the famous line, "Say Hello to my little friend!" the PDP-5080HD excellently reproduces the intricate details of the sweat dripping from his brow and the cocaine still caked onto his nose. To test the Pioneer PDP-5080HD with standard-definition input, we watched a rerun of Law and Order via local channel. There was minor pixilation in dark scenes, but this may be attributed to the relative weakness of the analog over-the-air signal. The picture reproduction and upconversion for standard definition seems to be quite good when compared to the rest of the industry. One additional upgrade in the PDP-5080HD over the previous model of nominal import is the acceptance of 1080p signals. Almost any device that generates 1080p can also generate the lower but matched 1080i or 720p.The PDP-5080HD also seemed to have imoproved non glare performance. The unit has a professional feel and has a user friendly menu. Aspect ration settings are: 4:3 (with sidebars), Full, Zoom, Cinema, and Wide. The Full mode evenly stretches the image across the screen while Wide uses a special algorithm to minimize the picture's distortion. Cinema mode cuts off the far edges of the screen of movies to minimize the size of the letter-boxes for 2:35:1 aspect ratio movies. Aesthetically the PDP-5080HD is relatively unchanged from its predecessor, the PDP-5080HD. Pioneer includes Split-screen / Picture-in-Picture functionality. Some users, especially sports fanatics, find this to be a useful feature, but it cannot be used with a cable or satellite TV box because it requires two separate inputs. Additionally, the PDP-5080HD has the TV Guide On-Screen Interactive Program Guide. Again those users who utilize a cable or satellite box or a TiVo unit will rarely use this feature. There are several other inputs as well—three component video inputs, four composite video inputs, two S-Video connections, and a PC Input. Additionally, Pioneer is one of the few brands to include the much-maligned CableCard slot in its latest series televisions. While hooking up their components into the right input connections may be a daunting task for the everyday consumer, the direct-input buttons on Pioneer's included universal remote control make it possible to switch inputs with ease. The Pioneer PDP-5080HD's On-Screen menu system is easy to navigate with all applicable categories, Picture, Audio, etc., easily recognizable. Buttons on the remote control are logically laid-out and appropriately sized. The remote is universal, but it effectively hides the rarely-used buttons for other sources under its slide-screen. Although the remote is quite functional, it is a dull gray color—it does not match the glossy black finish of the television—and it is a bit chintzy. The PDP-5080HD continues with an Energy-saving mode to reduce power consumption. If you are watching in a dark or semi-dark environment, you may get away with using this feature. Contrast and brightness settings are drastically reduced when using this feature, thus it will not show well in a brightly lit room. Pioneer's plasma televisions are consistently of very high quality. They are also higher-priced than the plasma televisions made by their primary competitors, Panasonic and Samsung. 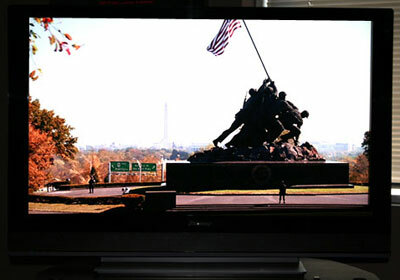 When compared with top LCD panel manufacturers, Pioneer is still priced at just less than a Sharp or Sony 1080p 52" LCD. Pioneer works hard on ensuring classy aesthetics and a full feature set such as Picture-in-Picture, cable card connection and upgraded sound quality not to mention quality plasma cell structure. All these features compare to the upgraded models from Panasonic and Samsung. When reviewing this unit from top to bottom the word "quality" echoes thoroughly. If Pioneer is your choice, I would not hesitate to recommend the PDP-5080HD. Current market price for the PDP-5080HD is around $3,000. Be sure to always buy your Pioneer plasma no matter what model from an authorized dealer as Pioneer's warranty repair is not valid if the product is purchased from a dealer outside their authorized dealer network. Despite the higher price, the PDP-5080HD is perfect for those consumers who want the very best aesthetics, connectivity, performance and quality.